And now to interrupt our regularly scheduled posts... I've had a request from my sweet friend Erin to share my chicken stew recipe.... however I'm not sure I've ever made a chicken stew. So I took a look through my thousands of photos and I THINK I found what she was looking for. 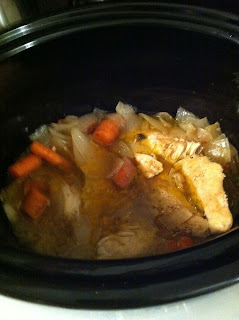 :) Anyone up for crock pot chicken? 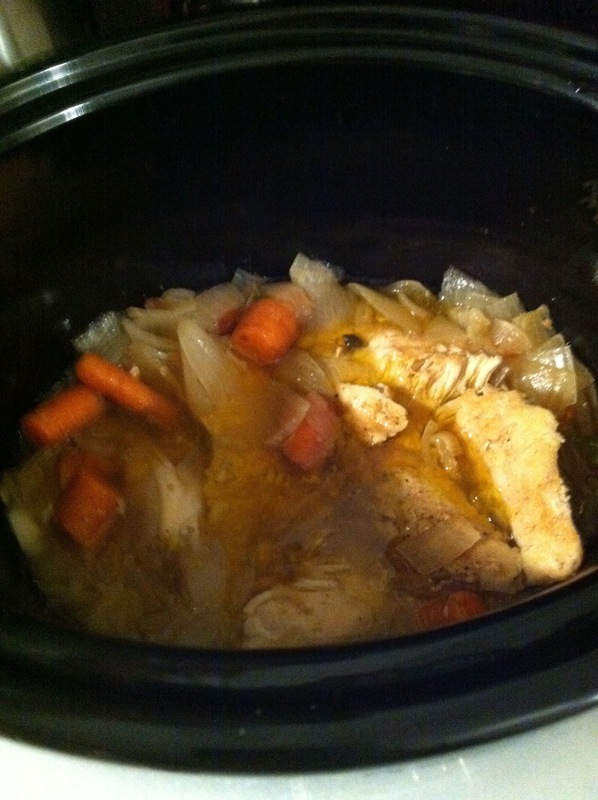 You know how much I LOVE my crock pot! Let's see if I can get you loving yours, too! Cover the bottom of your crock pot in extra virgin olive oil, not a pool of it, just enough to cover the bottom- then lightly salt, pepper and seasoned salt the olive oil. Now take about 2 teaspoons of chicken bouillon (2 cubes) and break it around into the olive oil. Place the chicken breasts in the crock pot. Go ahead and turn the crock pot on 'high' for 8 or 10 hours- no lid yet, you've still got to add a few bits. Lightly drizzle more extra virgin olive oil and seasoned salt all over the chicken breasts. Mince 1 or 2 cloves of garlic and add it on top of the chicken breasts. While that's starting to get warm, chop up 1 large yellow onion- I think I actually used 2 but I really love cooked onions so that's up to you. Throw them in! It's OK if they're on top of and on the sides of the chicken. Now chop up some whole carrots, maybe 4-7 depending on their size OR use an entire bag of baby carrots... sounds like a lot but if your chicken breasts are a decent size, it won't be too many, you can decide what's best there. Just remember, the carrots cook down. Throw them in! If you're feeling REALLY saucy, pour in a little white wine- not too much, just a taste. I did. If you're feeling even SAUCIER, throw in a handful of sliced mushrooms and swap the white wine for a little red... ooh baby. Drizzle just a little more olive oil over the whole thing, a little more salt and pepper, place the lid on top and leave it! That's it! It's so easy! Also, for those of you thinking I'm some kind of nut job, no, there's no need to add water anywhere in that process. The meat, the onions and the carrots will create a LOT of their own juices and that's all you'll need. Besides, it keeps the flavors so present that way! 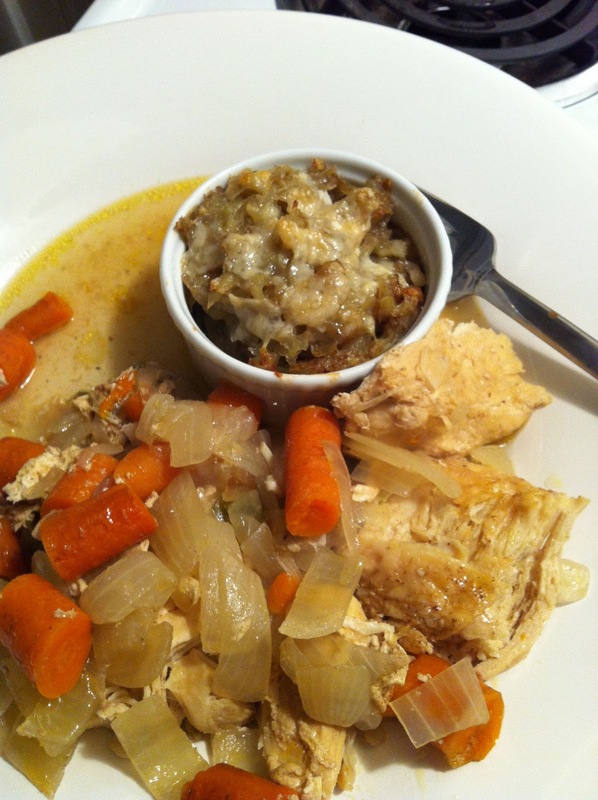 No room for watered down recipes in your kitchen! 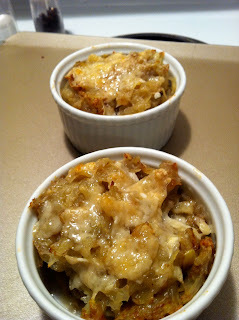 The other thing that Erin said to me when she was requesting this recipe was that she thought I made it with potato hash. I did... it was awesome. So I highly recommend either potato hash or a really simple brown rice or cous cous to go with this. I had 8 million potatoes to use before we left town and also a little parmesan reggiano left before it spoiled so I made potato hash. I won't give you a whole recipe for that just because it was too easy, but I'll tell you the basics. Heat your oven to 350 degrees. Grate some potatoes with your cheese grater so they look like shredded cheese. It takes awhile and hurts your hands a little but the look of these things is so worth it. Warm some olive oil and sea salt (or regular salt) in a skillet. 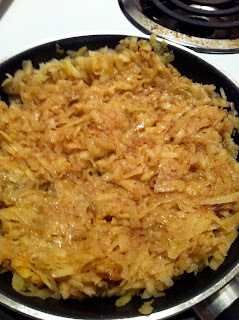 Add the grated potatoes, some seasoned salt and stir until golden brown and maybe a little crispy, like hash browns. Salt and pepper them to taste. Then in individual ramekins (those tiny, cute dishes that creme brulee is normally served in), divvy out the grated potatoes. Bake them on a baking sheet for about 5-10 minutes. Then pull them out, top with parmesan reggiano cheese, or whatever other fabulous cheese you have in the fridge and broil on high for about 3 minutes or until golden and bubbly. Ta da! Now just throw together some chopped romaine, tomatoes, maybe a few nuts and clementines, top it with a light dressing of tahini and lemon juice and call it a dinner! Erin, and all of you other sweet friends, happy crock potting! Yes! This is totally it! Can't wait to try it and the potato hash too! Thanks for sharing! you've gotta show me photos if you make it and tell me if you loved it or hated it haha! :) honesty is key! haha well I tried it before you posted and I was guessing on most of it and it turned out great! Except I put chopped potatoes in it instead of the hash, and I used lots of fresh garlic and "chicken seasoning" and lemon pepper on the chicken [still used the bullion at the bottom of the pot]. Mmmmm. It was so good. I let mine go a little too long, the chicken was slightly dry but the flavor was ALL there!!! Can't wait to try the hash now! oh my gosh you little miss kitchen adventurer! way to go! also way to be gutsy and use lemon pepper seasoning! i have such a hard time with that... never ends up being the right seasoning in proportion... i guess i just don't know how to use it! love it friend! thanks for sharing!